Email is a comment way for communication, everyone wants to use email, but most regular email services are not very safe. What does it mean? It means your email can be stolen and sniffed before you got or after you sent. Only a few email services encrypted data, or use HTTPS (Hypertext Transfer Protocol Secure). Most people do not care about that, people think we have nothing to hide, but if you want to talk about some private issues like your finance, banking information, private message, you should be carefully. Today, I would like to introduce a secured email service. 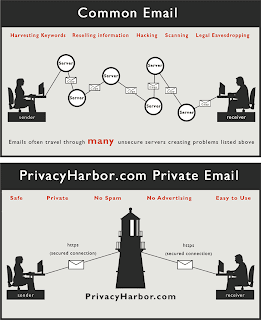 Privacy Harbor is a private email service, it offers a very secured way to keep your personal email safety. It also uses SnapGuard pre-inbox filter to protect your data do not attack from spam, scams, viruses or identity theft. The special way is it keeps your email content in server (they are never been sent), receiver only get a notification with a regular email, it must follow a link that takes receiver to Privacy Harbor to read email content. It must to conform authentication process that allows you to read email. If receiver want reply email he can direct do that on Privacy Harbor as compose a regular email. The best point is you do not have to download and install any special software, or use personal encryption key. Actually, it is simple as regular email. Privacy Harbor offers free and paid accounts, free users can get 500MB storage.